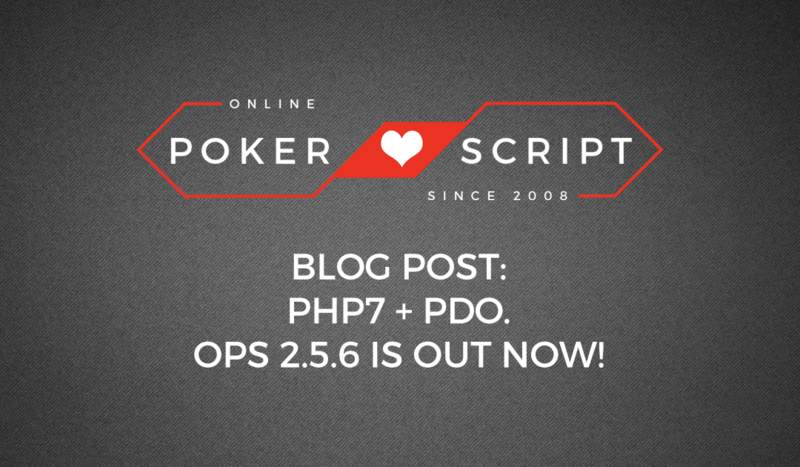 Today I’m proud to announce that Online Poker Script is fully compatible with PHP7+. This was long overdue and is finally ready. All members with an ACTIVE license can now download the latest version through their members hub upon login. Additionally, we’ve fixed a lot of bugs that where showing up when the error reporting was turned on. This was mostly due to not being compatible with PHP7+ which is now solved. As of 2.5.6, OPS works with PHP 5+ and has been tested up to PHP 7+. Although we can’t guarantee your server will work for our script, we’re sure that if you get a shared hosting package with a hosting service like Bluehost, Cloudustries or even GoDaddy you should be able to run our script without issues. Enjoy this great update and get ready for many more! PS: If you don’t have a license yet, now is your time: Click here to Get A License! – soon we’ll be introducing a FULL redesign on the script which will change the game for running your own online poker website forever! PHP Poker, Chinese Hackers and Success!